Orchestra ONE… the Orchestra of New Experiences…. is a large ensemble for young musicians between the ages of 8 and 18. 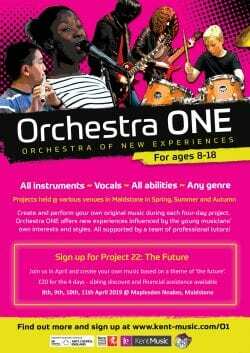 Members of Orchestra ONE come from a wide range of musical backgrounds and create their own original music during each four day project. Every project offers a new experience influenced by changing themes, collaborations and specialist tutor teams but most importantly by the young musicians’ own interests, styles and instrumentation. Participants range from long term members to newcomers which ensures support and renewal as Orchestra ONE continues to develop. What standard do you have to be to join? You can be of any standard. Many of our members never played an instrument before they attended Orchestra ONE, others are experienced musicians. What instruments/musicians play in the Orchestra? 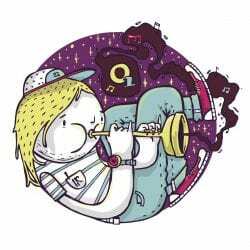 All musicians are welcome, no matter of style or ability: jazzers, DJs, classical players, folk musicians, self-taught individuals, MCs, singers, sounds designers… absolutely every young musician is welcome to apply. No. You will not have to audition for any of our local music groups. £20 per participant per project. Sibling discount and Financial Assistance is also available.